There’s been a common theme in my house recently, of meals that require no heat to make. No roasting, sauteing, boiling, frying… nothing. The less heat, and less work required, the better. Which means tubs of ice cream are my best friend, but also, vegetables, because balance. Too hot to cook + lazy = noshing on whole cucumbers and calling it a meal. But I digress — let’s get back to the vegetables, here. I am a huge fan of eating veggies just as they are, but let’s face it, they get boring pretty quick. Enter, cucumber salad. 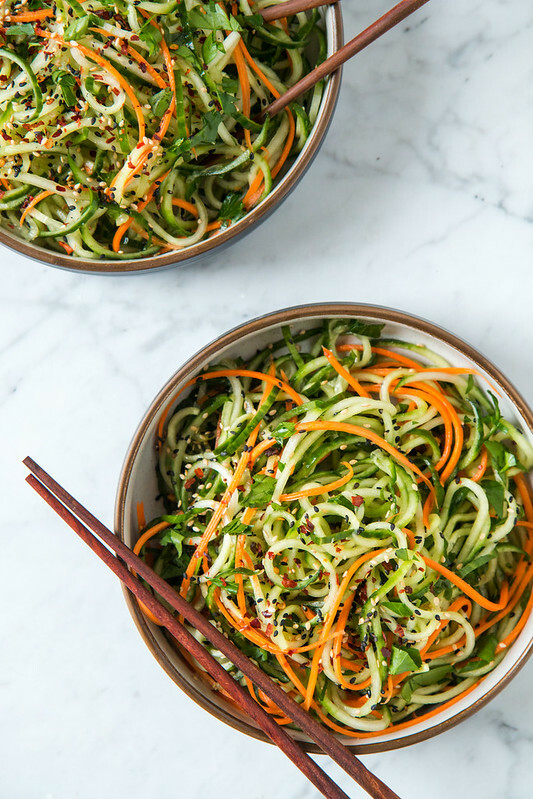 But not just any ol’ cucumber salad — spiralized, noodly, sweet and tangy sesame vinaigrette cucumber salad. This is one of those things you can throw together on a daily basis, because besides the cucumber, everything in it is just a pantry staple. 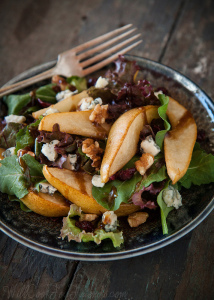 Crunchy, refreshing, flavorful, and it doesn’t threaten my chances of winning laziest person of the year award? Score! 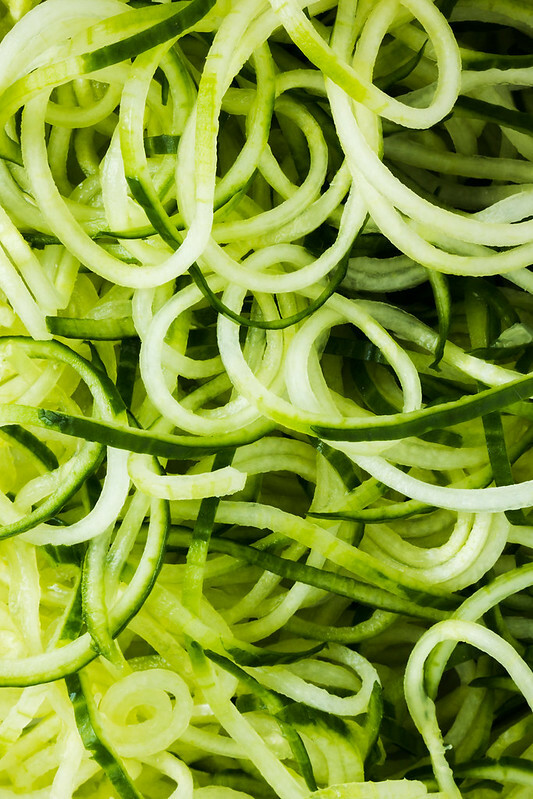 If zucchini noodles are called zoodles, does that make cucumber noodles… coodles? Cukels? 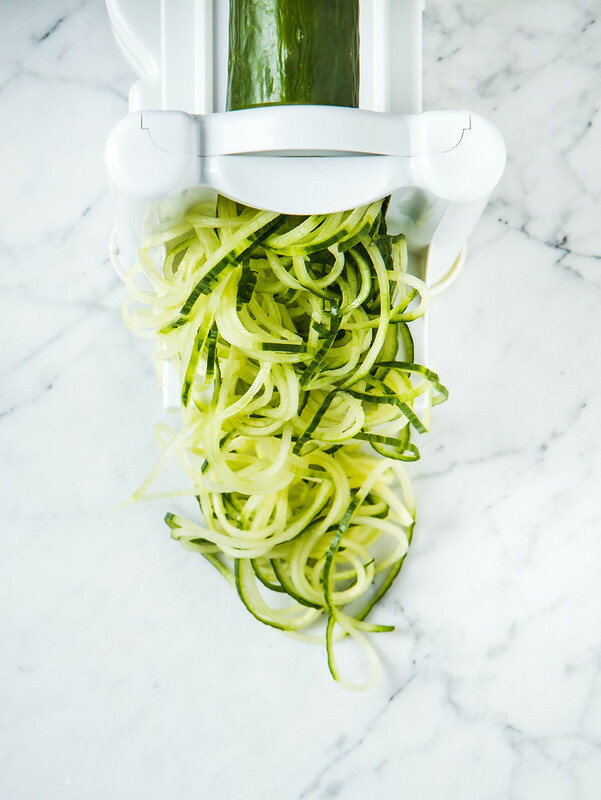 Update: for those of you wanting to know (I get asked all the time) this is the spiralizer I use: Paderno World Cuisine Spiral Vegetable Slicer . I chose this one because it comes with multiple blades, which store within the unit itself. It’s a little bit bulky for storing, but so far I’ve been happy with it! I recently met someone who told me, they don’t *like* cucumbers. Wha’? How is that possible? I want to know, do you like cucumbers, and if so, what’s your favorite way to eat them? And if not… have you tried this cucumber salad? 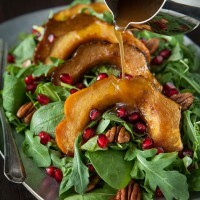 Honey can be replaced with maple syrup or other liquid sweetener, if you wish to make this salad vegan. Note: this post contains affiliate links. This means if you click on a link and make a purchase, even if it isn’t the item I mentioned, I receive a small percentage (at no extra cost to you). 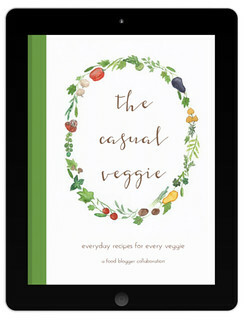 This helps support this blog, and makes it possible for me to bring you tasty recipes! I only share links to items I personally use or would recommend, and I have no outside incentive to promote a particular item or product — all opinions are my own. 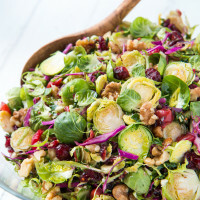 This salad sounds so good! Such a perfect thing to eat when it’s too hot to even go near the stove. I’m jealous of your cucumbers — our CSA has only been giving us lemon cucumbers, which are 90% seeds, and therefore very hard to spiralize or julienne. Must go find some big cucumbers! This is brilliant! I can’t wait to try it!!!! Thanks Marcia, I hope you like it! Hi Sandrea! The one I have is the Paderno World Cuisine Tri-Blade Plastic Spiral Vegetable Slicer — I got it on Amazon, and love it. It works well, cleans up fairly easily, and the blades store underneath it. The only downside is it takes up a bit of space to store, but other than that it’s great. Hope that helps! Thank you! There is a lot of options on spiralizers on amazon, may I ask how you went about choosing the paderno spiralizer vs. the spiralizer and brieftons brand? Got a spiralizer for Christmas , it’s awesome. That’s awesome, Dawn! I’m glad you like the salad! Casta! That’s brilliant! Thanks for sharing, Danielle! Do you peel the cucumbers before spiralizing? Hi Marla! I don’t peel them. I like to use English (also known as hothouse) cucumbers, which have a very pleasant skin. If you’re using a cucumber that has a very waxy or bitter skin, you can certainly peel them first, but if you can find the English ones I recommend those, as they have less water content and won’t water down the dressing as much. Hope that helps! Thanks, Alicia, I’m so glad you liked it! The cucumbers with onions and dill sounds amazing — reminds me of a salad my parents used to make! 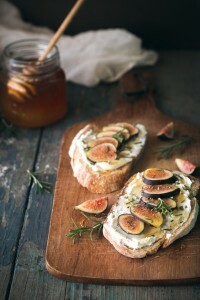 I’m going to make this for a lunch next week, what would be good to serve with this? Hi Patty — wonderful, I hope you like the salad! If you’re wanting to stick to Asian flavors, or a light and healthy theme, you could go with this simple Miso Soup, or these Vegetable Spring Rolls with Peanut Dipping Sauce. Otherwise, I’d say you could serve it with just about anything! Grilled chicken and veggies on the side would be great for a heartier meal, or a grain like rice pilaf or this Malaysian Quinoa dish. I hope that helps! Casta? That was a good suggestion. My silly side likes Cumberdoodles. I am absolutely trying this dish! Heheh, I like Cumberdoodles, too! I hope you like the salad! Have you tried with zucchini instead of cucumbers? I cannot eat cucumbers. Thanks. Hi Bobbie! I have not tried using zucchini in this particular recipe, but I bet it would work well! 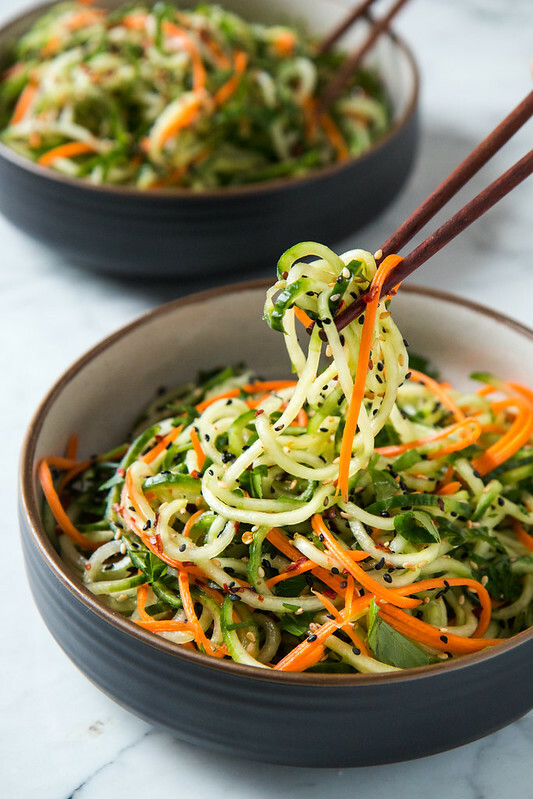 I’ve spiralized zucchini for other recipes, and while it has more texture and flavor than cucumber, I’m sure it would still be delicious here. Hope that helps! I make zucchini noodles all the time. They’re wonderful raw with some pasta sauce. I think they would also lend themselves very well to this recipe. Great recipe but can’t find the nutritional info. Can you help me with this? Thanks. Hi Kathrine! I’m not sure exactly what aspects of the nutritional info you’re looking for, but cucumbers and carrots are very low in calories (maybe 20-30 calories a piece? ), and so are most of the other ingredients. Most of the calories in this recipe come from the honey (65 calories per TBSP, and you can adjust the amount to taste), and the toasted sesame seeds and oil (1 tsp. of the sesame oil is about 40 calories, and 1 TBSP sesame seeds is about 50 calories). The exact nutritional info will vary a bit depending on the size and sweetness of your vegetables, and how much honey you use. You can get more specific info on each ingredient by doing a google search like “nutritional information honey” or whatever ingredient you want to know more about. I hope that helps! I made this for dinner and added shrimp and avocado. It was delicious!! Also, I subbed the honey for a tsp. of agave nectar and it worked well. Thanks for the fabulous recipe! Sounds wonderful, Nikki! Glad you liked it! lol i enjoyed reading your article ! I love your personality ! Can’t wait to try this !! Thanks Yesonia, I hope you like it! How long can you store this? I make my salads in order to take them to work every day. Is this a one day recipe or can it be stored for a week? I put my salads in mason jars and take them to work each day. 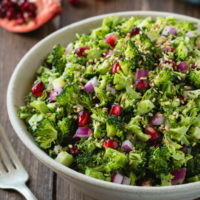 I would suggest eating this salad right away, because the cucumbers will release a lot of liquid and water down the dressing, making it bland and a little soupy. That said, you could keep the cucumber noodles in one jar, and the dressing in another, then when you’re ready to eat, just drain any liquid off the noodles before adding the dressing. I hope that helps! Attempted this a few weeks back – the noodles never drained enough to consider using them. I may have used too small a blade in the spiralizer, though. Wish I hadn’t given up, but I was not about to experiment further given the price of Seedless Cucumbers these days – I was already into the dish for $8 when I pitched the noodles! Hi Cops — I’m sorry to hear it didn’t work out for you! I’m surprised the noodles didn’t drain enough, I haven’t encountered that problem myself. And I’m extra sorry to know they cost so much where you live — English cucumbers here are maybe 50 cents a piece or so. It’s always a major bummer when an expensive ingredient doesn’t work out! Coodles FTW! (For the win for all you non-nerdy people! I thought I didn’t like cucumbers (the soggy & crunchy isn’t s texture I like), but as coodles I <3 cucumbers! ??? Made this. Taste is good. But for salad I expect crunchy . This had texture of cooked spaghetti. Is that correct or did I do something wrong. Hi Ann! There are two kinds of sesame oil – plain sesame oil is light in color and has very little flavor, while toasted sesame oil is dark brown in color and has a very strong sesame flavor. You can typically find toasted sesame oil in the international or Asian aisle of the grocery store. As for the sesame seeds themselves, you can toast them quickly in a dry pan over low heat until lightly golden to bring out the flavor, or you can use them raw. They’re good either way. I hope that helps, and have fun with your party! Love cutting cucumbers into thin slices and mixing them into some sour cream. Add a little salt and pepper to the mix and its a perfect side dish to meats at dinnertime. (Polish family) Call it mizeria. Mmm, sounds delicious! Thanks for sharing! Edible water bottles! You are a genius. Thanks for the feedback, Pam! That’s a great idea using cabbage and other veggies. I’ll have to try that sometime! Made this tonight. Really enjoyed it. Clever use for all the cucumbers that are abounding in my garden right now! 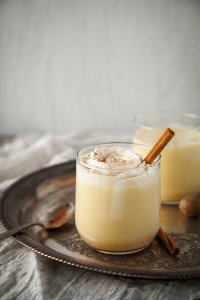 :-) Great flavor and easy to whip up. The cucumbers did continue to drain so added the dressing very last second so I could continue to dry the cucumbers with a towel. Husband liked it as well, will make again. Thanks! Thanks, Roxanne, I’m so glad you liked it! Wondering, do I use the green or white or both of the scallion? I never know…;) thanks! Hi Angela — my apologies for not replying to this sooner! I use both here, but you can just use the green portions if the white have too strong of an onion flavor for your tastes. Hope that helps! Would love to give this a go tomorrow but no idea what type of cucumber is best! Can I use English cucumber or is that too watery? Thanks! Hi Phen! English cucumbers are perfect for this salad. They actually have less water content than garden cucumbers, and their skin is sweeter and less waxy so there’s no need to peel them. I’ve updated the recipe to specify that they are the kind I used. I hope you like this salad! Hi Paulina! I don’t include nutritional information with my recipes because it’s just not possible to be 100% accurate. (For example, this recipe calls for honey [i]to taste[/i], and since I can’t know how much you will use, or the size of your cucumbers, etc., I can’t say what the exact nutritional information will be). If you’re needing the information for health reasons, I recommend using a site like caloriecount.com — it’s free to create an account and plug in your ingredients/amounts to get an accurate estimate of calories, fat, protein, etc.. If you don’t like that one there are other sites out there, too, that’s just a popular one I know a lot of people use. :) Hope that helps! Absolutely delicious! So refreshing, and made a great accompaniment to salmon. Thank you. Thanks Claire, I’m so glad you liked it! Wow. So good ad so easy. Thank you! Perfect salad that I was looking for. 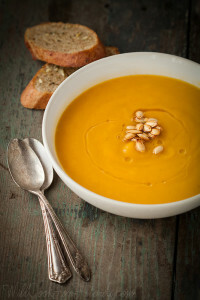 Simple and tasty, what a great way to add veggies in your life. Plus cucumbers are the best !! Add cilantro and I’m in heaven. I was looking for something cool to go alongside a hot (yellow) curry dish that was carb-heavy with rice. This was outstanding. I followed it to the letter and loved the notion of leaving the skin on the cukes. The only variation was that I added some sliced cherry tomatoes. 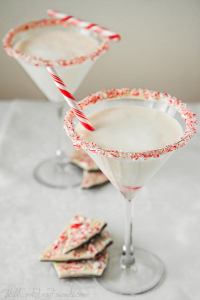 This recipe was super easy and delicious! Thanks for sharing. How far in advance do you think this could be made? Seems like it would just get better with time, but don’t want it soggy either. Hi Amanda! I actually find it best served right away. The cucumber, once spiralized, will continue to release moisture and eventually it will start to water down the dressing and can even become a bit soupy. One thing that helps is making the dressing and storing it on the side, then spiralizing the cucumber and keeping it in a container lined with paper towels (or a clean dish towel) to absorb excess moisture. Then when you are ready to serve you can mix the cucumber and dressing and are good to go. I hope that helps! 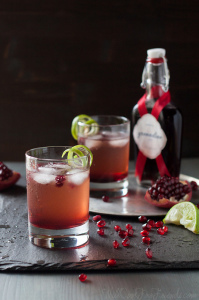 Love this recipe and definitely will try it. I like the name coodles and for the carrots I think we should call them caroodles. Two cucumber recipes coming to mind that I adore. The first is sliced cucumbers and onions with a little sugar and vinegar and the second is basically the same recipe only sour cream is added and they are really divine. I love caroodles, Susan-Jane! And those recipes sound delicious… I’ve never tried it with the sour cream added, I’ll have to do that next time. Thanks for the tip!